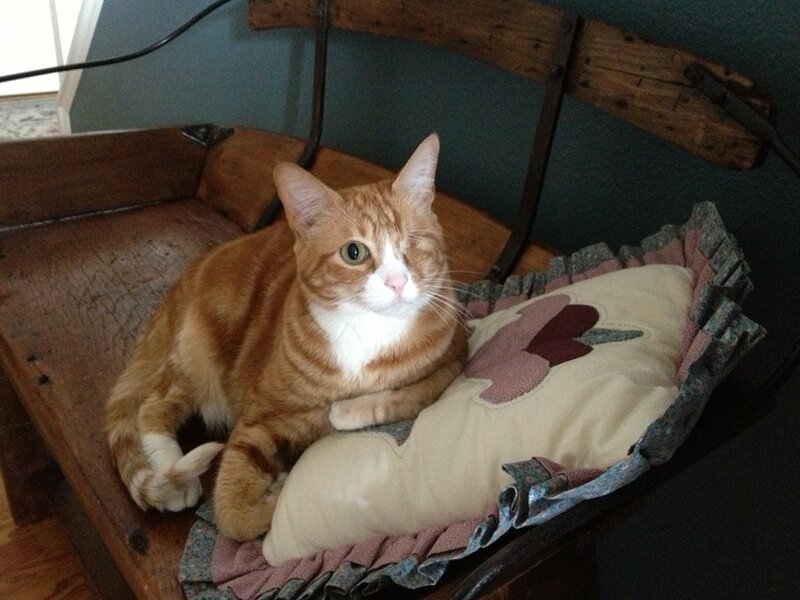 As we settle in for work each morning at the Healing Touch for Animals® (HTA) office, an orange, bull’s-eye tabby cat named Patch often comes in to greet us. Our unofficial mascot—and feline companion to HTA founder Carol Komitor—weaves his way through the office, stopping by nearly everyone for a quick scratch behind the ears…each pause punctuated by his delicate mews. Although most of us wouldn’t mind living Patch’s luxuriously lazy life, he had a fairly rough time of it before he found his forever home with Carol. She first spotted him after a business meeting at a local animal shelter, noticing instantly the stitches that covered the place where his left eye had been. What truly struck Carol was that in spite of his serious injuries from being hit by a car, he still had an amazing willingness to connect with the humans around him. His instant connection with Carol was particularly strong, and she knew she had to bring him home. Named “Patch” both for Carol’s love of quilting and the obvious handiwork to his eye, this sweet and engaging animal would be given a second chance. 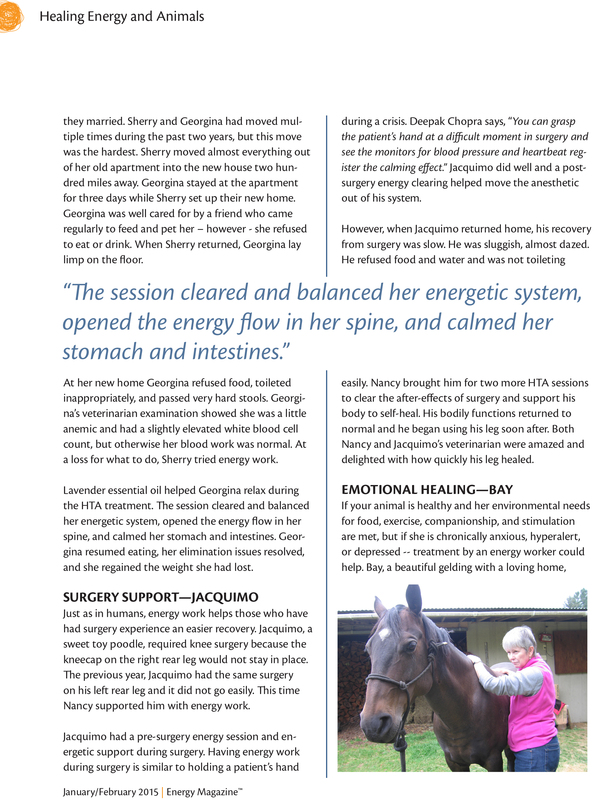 Carol knew that Healing Touch for Animals® would both help him to heal more quickly from his physical injuries as well as assist him in integrating into a new household. Soon after his arrival into Carol’s home, she began doing daily HTA sessions along with the application of essential oils. This helped give Patch relief from pain at the eye enucleation site as well as his other injuries. Carol found that three essential oils were most helpful in Patch’s recovery and assimilation into his new home: Copaiba, which helped reduce inflammation around his eye, and Peace and Calming and Basil essential oils, which aided with Patch’s emotional mending. Whereas traditional veterinary medicine enabled Patch to survive his injuries, HTA along with essential oils gave him what he needed not only to heal but to thrive. As a frequent visitor to the Healing Touch for Animals® and an essential member of Carol’s household, Patch is a visual reminder of just how empowering energy medicine is to the body’s ability to self-heal. The knowledge that the human body is made up of layers of energy is not something new. It is a way of life for many different societies and energy healing methods have been practiced for thousands of years all over the world. Having an understanding of how the body responds while energy medicine is being facilitated provides the basics of how healing occurs. 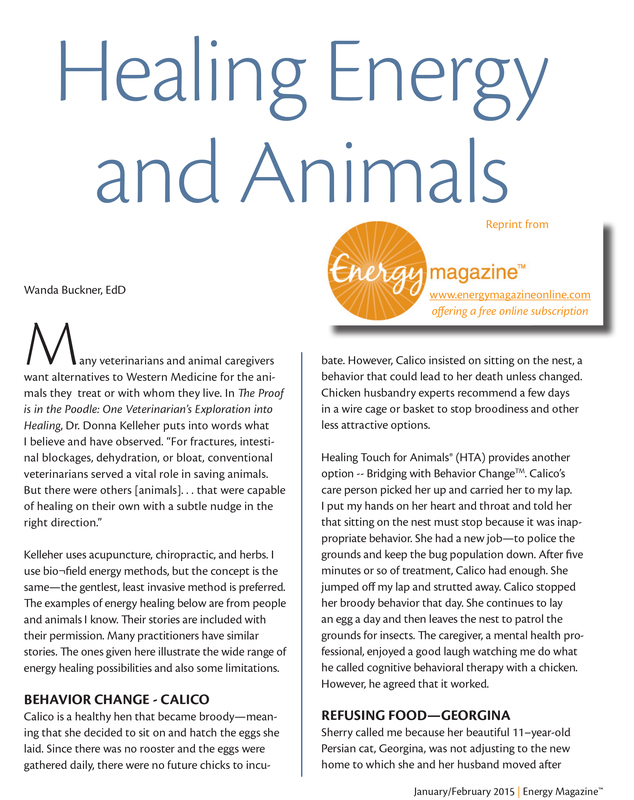 Founder of Healing Touch for Animals® Carol Komitor developed the Physiology Response of Energy Healing chart to help explain how energy medicine works for people as well as animals. This chart illustrates a full perspective of the body’s reactions to energy medicine. With energetic vocabulary, the chart describes the physiological response of the body while being treated with energy medicine. If one follows the chart clockwise, starting with “Relaxes Body” and finishing with “Regulates Immune System,” the body’s reactions during a healing session are depicted. 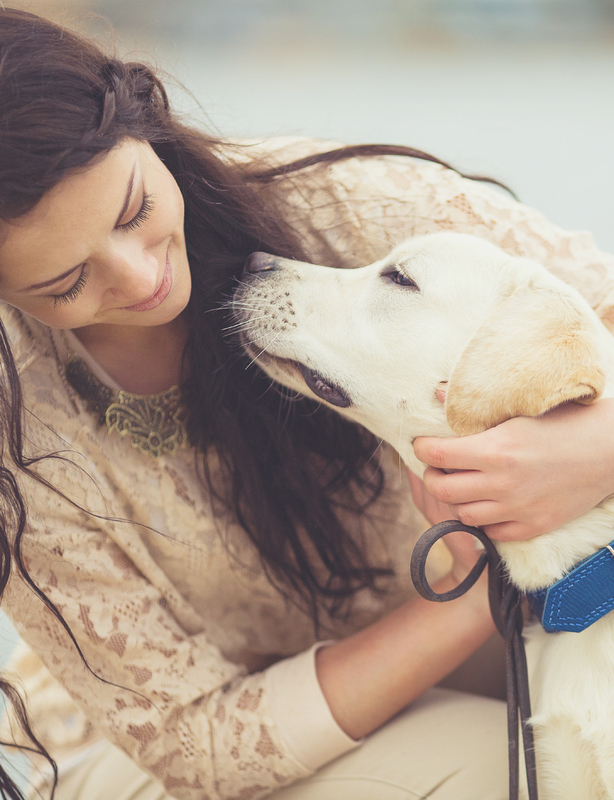 Animals in particular are quite responsive to this noninvasive healing method that releases endorphins to create a deep relaxation, enabling the body to function at a higher level . When the muscles are relaxed, circulation efficiency increases, sending more hormones, nutrients, and oxygen through the body. This offers assistance with healing from injuries and illness to surgeries and wound healing, as well as behavioral and stress-related issues. 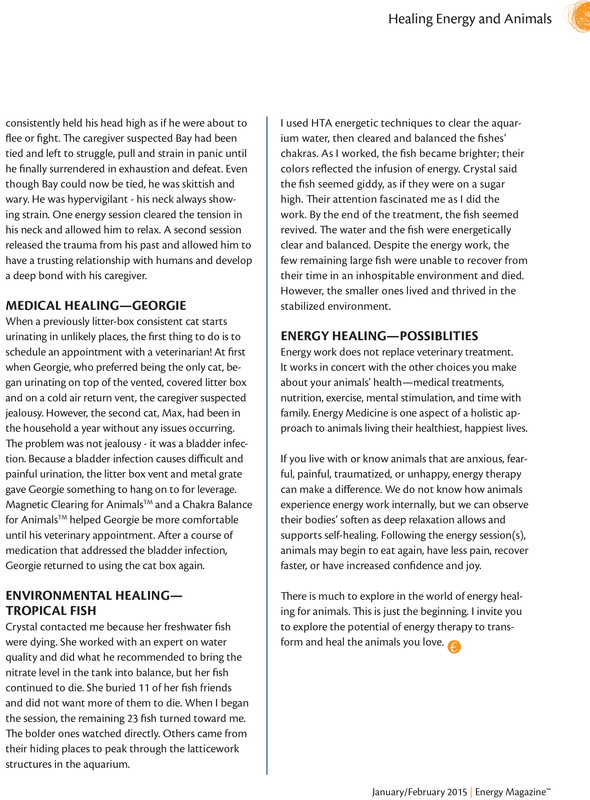 Healing Touch for Animals® uses energy medicine therapies to integrate, stabilize, and clear the energy body. HTA works through the release of endorphins to create a deep relaxation and state of being. This in turn allows the body to function at a higher level, increasing circulation and enabling the body to be more receptive to healing. HTA techniques work with all levels of physiology: emotional, instinctual, mental, and physical. 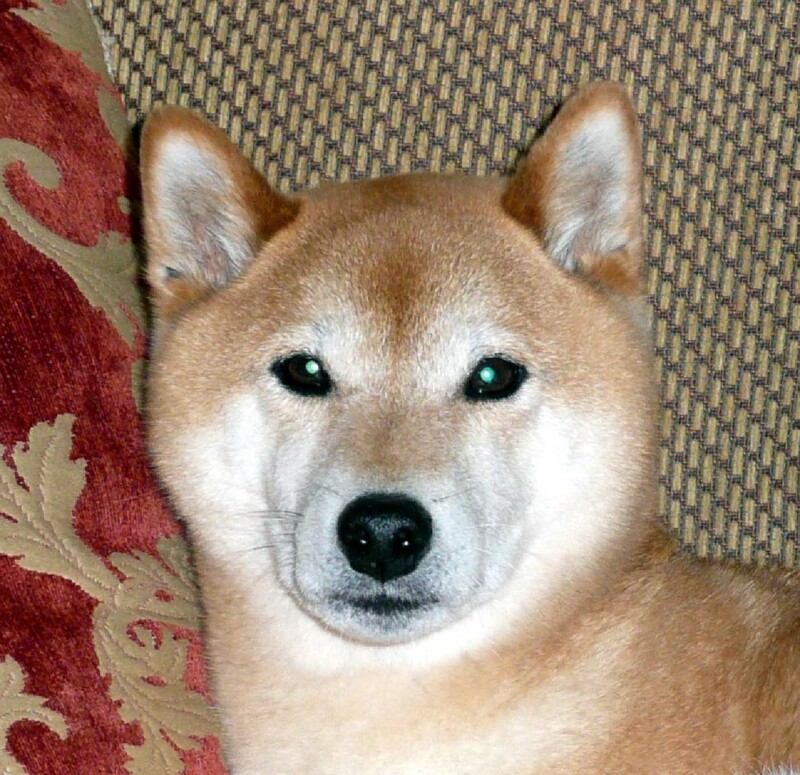 The HTA program gives animals the opportunity to have a deeper instinctual presence and awareness of their bodies. It is worth mentioning too that energy medicine therapies are recognized by the National Institutes of Health. These inspiring courses are offered in cities throughout the United States, in Canada, and in the Netherlands.